(Nanowerk News) Researchers from North Carolina State University have discovered a way to make pinpoint changes to an enzyme-driven “assembly line” that will enable scientists to improve or change the properties of existing antibiotics as well as create designer compounds. The work (ACS Chemical Biology, "Inversion of Extender Unit Selectivity in the Erythromycin Polyketide Synthase by Acyltransferase Domain Engineering") is the first to efficiently manipulate which building blocks the enzyme selects in the act of synthesizing erythromycin, an important antibiotic. Many antibiotics are synthesized by huge sets of enzymes called polyketide synthases: a series of proteins arranged in a particular order that recruit specific small molecule building blocks to assemble the drug of interest. Picture an automobile assembly line – a car is assembled sequentially, using various interchangeable parts as it moves from one workstation to the next in line. Drug synthesis via polyketide synthases works in much the same way. Each protein module acts as a workstation responsible for selecting and adding another specific building block to the antibiotic. Improving upon existing antibiotics is an efficient way to create new drugs in terms of both time and cost. If researchers could manipulate the function of each module in the enzyme assembly line, it would allow them to design man-made molecules, thus fine-tuning the pharmacological properties of a drug. However, no one had been able to discover how to make small tweaks to an enzyme module in order to completely change which building blocks are selected during the assembly process. Gavin Williams, associate professor of bio-organic chemistry at NC State and corresponding author of a paper describing the work, along with former Ph.D. student and first author Irina Koryakina, former Ph.D student John McArthur and current Ph.D. student Christian Kasey, set out to discover how to make an enzyme module in erythromycin select a man-made building block. The group looked at a protein module designated Ery6, which is the sixth module, or workstation on the assembly line, for erythromycin. They found that the module identifies and installs a methyl group building block. By genetically altering the active site of the enzyme they were able to make changes to single amino acids in that area, engineering the enzyme to reject the naturally occurring substrate, or building block, that it normally selected in favor of a man-made substrate the researchers preferred. 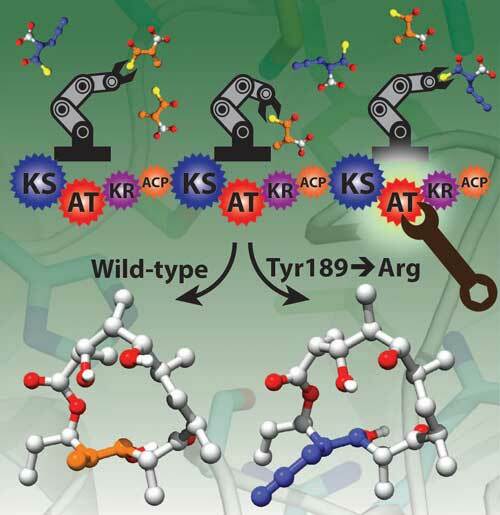 “Previously, most changes to these compounds have been in the form of swapping out an entire enzyme module, rather than tweaking functionality within it,” Williams says. “Instead of a hatchet, our method is more surgical, making small but impactful changes to the module that won’t change its overall function while allowing us to fine tune the portions of the compound that we select.